Set of Japa mala, made from Tulasi wood, with head bead in foreground. A Japa mala, or simply mala (Sanskrit:माला; mālā, meaning garland), refers to a string of beads, popular in India and Buddhist countries, which are used for keeping count while reciting, chanting, or mentally repeating a mantra or the name/s of a particular deity. In both India and Asia, the recitation of mantras is a very popular practice. As sacred utterances, mantras can be repeated silently or chanted for different reasons and purposes. Used predominantly by the Hindus, Buddhists, and Sikhs as aids to meditation and devotion, mantras are sound vibrations that instill concentration in the devotee and facilitate spiritual growth. The devotional practice of Japa mala resembles the Roman Catholic use of the rosary. Both strings of beads help their respective religious believers to keep track of the number of times the prayer/mantra has been said. The Sanskrit word japa is derived from the root jap-, meaning "to utter in a low voice, repeat internally, mutter." Japa (Sanskrit: जप) is a spiritual discipline involving the meditative repetition of a mantra (or name) of God. The mantra or name may be spoken softly, enough for the practitioner to hear it, or it may be spoken purely within the recitor's mind. Japa may be performed whilst sitting in a meditation posture, while performing other activities, or as part of formal worship in group settings. The practice of repetitive prayer is present in varied forms within most religions in the world, although the religions of India generally give more emphasis to it as a specific discipline. The aim or goal of japa varies greatly depending on the mantra involved and the religious philosophy of the practitioner. In both Buddhist and Hindu traditions, mantras may be given to aspirants by their guru, after some form of initiation. The goal could be moksha, nirvana, bhakti, or simple personal communion with God in a similar way to prayer. In most forms of japa, the repetitions are counted using a string of beads known as a japa mala. Within Hindu traditions Vaishnava devotees commonly chant on beads made from the Tulsi plant (Holy Basil), held as a sacred manifestation of Tulsidevi; whereas Shaivites use Rudraksha beads. The number of beads in the Japa mala is generally 108, which has great significance in both traditions. 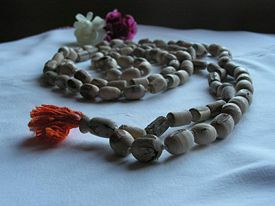 It is not uncommon for people to wear japa beads around their neck, although some practitioners (such as Gaudiya Vaishnavas) prefer to carry them in a bead-bag in order to keep them clean. Independent of all beads or prayer devices, many Hindus will recite mantras, either under their breath or in mental introspection, at any given time of the day. This sort of casual chanting is said to be a way of inspiring reflection on either the self or God at all times, thereby attaining a life which, though interrupted by daily chores and concerns, is a constant flow of prayer. Some Catholic prayer forms that involve repetition of prayers, such as use of the Rosary or one of various chaplets, could be classified as forms of japa, as with other Christian prayer forms. Additionally, Tibetan Buddhists include japa meditation as a large part of their religious practices. Mantras are often repeated hundreds or even thousands of times. The mala is used so that one can think about the meaning of the mantra as it is chanted rather than thinking about counting the repetitions. One mantra is usually said for every bead, turning the thumb clockwise around each bead, though some traditions or practices may call for counterclockwise or specific finger usage. When arriving at the head bead, one turns the mala around and then goes back in the same direction. This makes using the mala easier as the beads will not be so tight on the string when using them. The 109th bead on a mala is called the sumeru, bindu, stupa, or guru bead. Counting should always begin with a bead next to the sumeru. In the Hindu, Vedic tradition, if more than one mala of repetitions is to be done, one changes directions when reaching the sumeru rather than crossing it. The sumeru thus becomes the static point on the mala. Hindu tradition holds that the correct way to use a mala is with the right hand, with the thumb flicking one bead to the next, and with the mala draped over the middle finger. The index finger represents ego, the greatest impediment to Self-Realization, so it is considered best avoided (as with the ego) when chanting on a mala. In Northeast India, particularly those in the Shakta traditions in Bengal and Assam, the mala is often draped on the ring finger of the right hand, with beads moved by the middle finger with aid of the thumb and avoiding the use of the index finger. However, draping the mala over the middle finger and using the thumb to move the beads is also acceptable in these regions. Malas are also used in many forms of Mahayana Buddhism, often with a lesser number of beads (usually a divisor of 108). In Pure Land Buddhism, for instance, twenty-seven bead malas are common. In China, such malas are named "Shu-Zhu" (数珠）; in Japan, "Juzu." These shorter malas are sometimes used for counting prostrations because they are easier to hold when enumerating repeated prostrations. In Tibetan Buddhism, malas are also 108 beads: one mala counts as 100 mantras, and the 8 extra are meant to be dedicated to all sentient beings (the practice as a whole is dedicated at its end as well). The rosary (from Latin rosarium,, meaning "rose garden" or "garland of roses") is a popular traditional Roman Catholic devotional practice, which denotes both a set of prayer beads and the devotional prayer itself. The prayers consist of repeated sequences of the Lord's Prayer followed by ten recitations of the Hail Mary and a single recitation of "Glory Be to the Father." In Roman Catholicism, the rosary provides a physical method of keeping track of the number of Hail Marys said. Many similar prayer practices exist in popular Roman Catholicism, each with its own set of prescribed prayers and its own form of prayer beads. The fingers are moved along the beads as the prayers are recited. By not having to keep track of the count mentally, the mind is said to be more able to meditate on the mysteries. Although counting the prayers on a string of beads is customary, the prayers of the rosary do not actually require a set of beads, but can be said using any type of counting device, by counting on one's fingers, or by counting by oneself without any device at all. The beads are made from a wide variety of materials including wood, bone, glass, crushed flowers, semi-precious stones such as agate, jet, amber, or jasper, or precious materials including coral, crystal, silver, and gold. Rosaries are sometimes made from the seeds of the "rosary pea" or "bead tree." Today, the vast majority of rosary beads are made of glass, plastic, or wood. Early rosaries were strung on strong thread, often silk, but modern ones are more often made as a series of chain-linked beads. The rosary is sometimes used by other Christians, especially in the Anglican Communion and the Old Catholic Church, and also by some Lutherans. Evangelical Protestants, however, such as Baptists and Presbyterians do not use it and actively discourage their members from using this method of prayer. The prayer rope is used in Eastern Orthodox Christianity. A wide variety of materials are used to make mala beads. In Hinduism, Vaishnavas generally use the Japamaala of Tulsi beads. The Shaivites use that of Rudraksha beads. Aghori practitioners typically use fragments of human skull for their malas. Some Tibetan Buddhist traditions call for the use of bone (animal, most commonly yak) or sometimes human, the bones of past Lamas being the most valuable. Others use wood or seeds from the Bodhi Tree or seeds of the Lotus plant. Semi-precious stones such as carnelian and amethyst may be used, as well. The most common and least expensive material is sandalwood. In Hindu Tantra, as well as Buddhist Tantra or Vajrayana, materials and colors of the beads can relate to a specific practice. ↑ Vaman Shivram Apte, The Practical Sanskrit Dictionary (Delhi: Motilal Banarsidass Publishers, 1965), p. 758. ↑ Douglas Harper, Rosary, Online Etymology Dictionary. Retrieved June 25, 2008. ↑ Hensleigh Wedgewood, Rosary, A Dictionary of English Etymology. Retrieved June 25, 2008. Apte, Vaman Shivram. The Practical Sanskrit Dictionary. Delhi: Motilal Banarsidass Publishers, 1965. ISBN 81-208-0567-4. Panda, N.C. Japa Yoga: Theory Practice and Applications. D.K. Printworld, 2007. ISBN 978-8124603895. Sivanand, Swami. Japa Yoga A Comprehensive Treatise on Mantra-Sastra. Divine Life Soceity, 2005. ISBN 978-8170520184. Winston-Allen, Anne. Stories of the Rose: The Making of the Rosary in the Middle Ages. Pennsylvania State University Press, 1997. ISBN 0-2710-1631-0. This page was last modified on 25 July 2008, at 16:45.